Six-year-old Sir Des Champs is now unbeaten in seven starts after a scintillating four-and-a-half-length victory over Champion Court in the Jewson Novices’ Chase, his second win at the Cheltenham Festival following last season’s success in the Martin Pipe Conditional Jockeys’ Hurdle. Last year he was ridden to victory by Emmet Mullins but this time around it was the turn of Davy Russell, who was delighted to get on the winners’ list after a few near misses so far this week. Russell said: “Once he hit the tapes all I had to keep him on his feet. He was brilliant - wing, wing, wing all the way. He never missed a beat at every fence. “He is very good and awful lot of credit has to go to Aaron Madden, who absolutely adores this horse. Aaron has looked after him since the first day he arrived in Ireland with us and he has done such a wonderful job. “Everything went swimmingly and he is a good one. The last two fences were maybe a bit tight but I needed the company anyway as it turned out. “They went a good gallop, which suited, and I was always going to be positive because he stays further. My only worry was that maybe he wouldn’t travel but, after the first two fences, that was over with - I was travelling lovely. He did everything with aplomb and it was easy. Airline chief Michael O’Leary, whose company sponsors today’s Ryanair Chase, grabbed money offered by builders merchants Jewson when his horse Sir Des Champs won this Grade Two novices’ chase impressively. Yesterday O’Leary picked up places in two novice chases with Four Commanders, who was third in the Diamond Jubilee National Hunt Chase, and First Lieutenant, who was second in the RSA Chase. 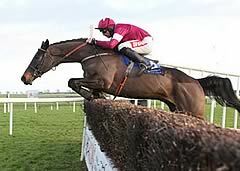 O’Leary added: “This is the first time this horse has really had it put up to him, and he did it very well. It was another peach of a ride around Cheltenham by Davy [Russell]. “It’s terrific, fantastic - and Willie is a genius anyway. We have been hitting the crossbar all week and it’s nice to finally stick one in the net. “It’s hard to know what you have under you get here. Willie has brought him along slowly and probably thought that he wanted a lot further but we had First Lieutenant in the other race. We just missed with him yesterday and it’s actually very refreshing not to be looking at Nicky Henderson’s bum, which I have been looking at all week . “I just wanted to say to two children at home, Matt and Luke, who said to me on the telephone this morning: “Daddy, all your horses are rubbish” - it’s very nice to get a winner. Such is the wealth of novice chasing talent this season in the maroon and white Gigginstown Stud colours that potentially the best of them all, Sir Des Champs, was diverted to Grade Two company for his Festival target. And after the Mouse Morris-trained First Lieutenant took second place in the RSA Chase on Wednesday, Sir Des Champs, from the Willie Mullins yard, went one better in the Jewson Novices’ Chase. It was a second Festival success for the six-year-old, after the Martin Pipe Conditional Jockeys’ Hurdle last year. And there is a further step up the ladder planned for 2013. The Martin Keighley-trained Champion Court put in a gallant effort against Sir Des Champs to finish four and a half lengths runner-up to the winner.